Answer to the Question Posed at Climate Etc. : By What Mechanism Does an El Niño Contribute to Global Warming? My apologies for not replying earlier. I was doing things that help pay my bills. I see that the clueless usual suspects are misrepresenting my work and expressing their total misunderstanding of ENSO. But that’s their choice, and it’s a waste of my time responding to their nonsense. Through numerous mechanisms, as I stated in my earlier reply to GaryM. The NODC Ocean Heat Content data for the tropical Pacific clearly shows the recharge phase during specific La Niña events. They include the 1973-76 La Niña, the 1995/96 La Niña and the 1998-01 La Niña. See the graph here. The impacts of those La Niña events are hard to miss. 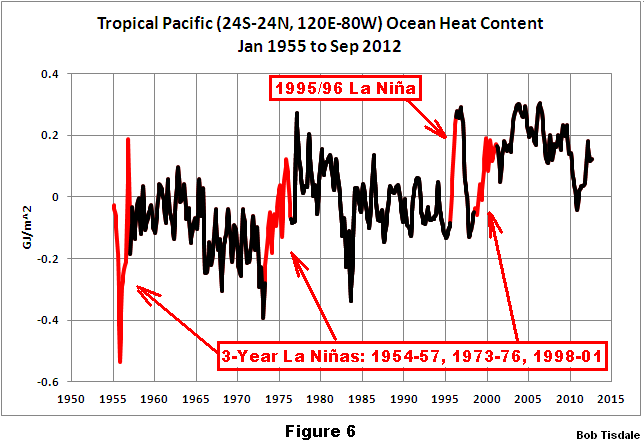 In fact, the vast majority of the warming of ocean heat content in the tropical Pacific was during La Niña events. I discussed the processes through which the ocean heat content for the tropical Pacific warms in that fashion in the post here, with support from a number of papers and datasets. ENSO also causes ocean heat from the tropical Pacific to be distributed poleward and into the Indian Ocean. This can be plainly seen in the animation of JPL sea level residual maps here after the end of the 1997/98 El Niño. The impact of the slow-moving downwelling Rossby wave traveling from east to west is blatantly obvious. 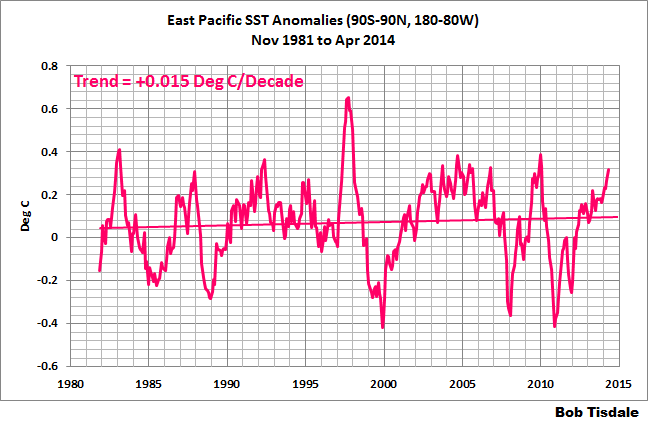 It’s carrying ENSO residuals back to the western tropical Pacific as the 1998-01 La Niña is forming. So while the trailing (recharging) La Niña is taking place, the left-over warm water from the El Niño is being distributed to the adjoining ocean basins. And where’d all that warm water come from? 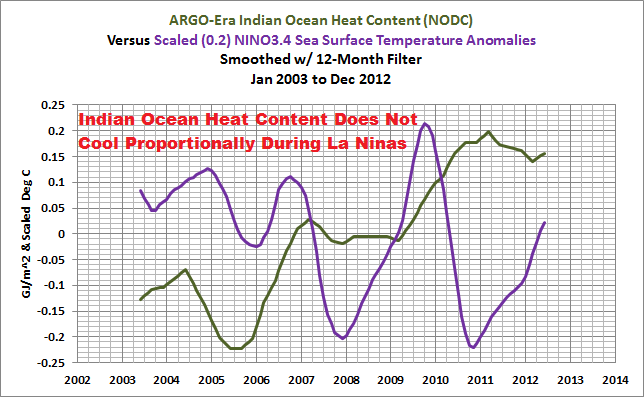 The 1995/96 La Niña, of course, as confirmed by the data in the graph linked earlier (here). And that brings us to the discharge phase. An El Niño discharges heat stored in the form of warm water from below the surface of the West Pacific Warm Pool, or as Trenberth et al. (2002) noted “the heat is stored in the western Pacific tropics.” That discharged warm water rises to the surface through upwelling and releases heat to the atmosphere during the El Niño (primarily through evaporation), and then all of the remaining warm water that was discharged by the El Niño is subsequently redistributed around the global oceans at the conclusion of the El Niño, some on the surface and some below the surface of the oceans. Let’s rephrase that because it’s important. The discharge phase is the release of “the heat [that] is stored in the western Pacific tropics”, which is taking subsurface warm water from the West Pacific Warm Pool and initially relocating it into the eastern tropical Pacific where it is upwelled to the surface and then subsequently redistributed at the conclusion of the El Niño. One of the byproducts of that discharge of warm water from “western Pacific tropics” is the release of heat to the atmosphere, and that’s what many persons focus on, but it’s only a portion of the discharge phase. Which brings us to the Trenberth “big jumps” in response to the strong El Niño events of 1986/87/88, 1997/98 and 2009/10. (I initially discussed Trenberth’s “big jumps” article here.) Those “big jumps” are plainly evident in the sea surface temperature anomalies of the South Atlantic, Indian and West Pacific Ocean. See the graph here. Two things are stand out in that graph: (1) the warming of the sea surface temperatures for the South Atlantic-Indian-West Pacific occurs during the El Niño events and (2) the sea surface temperatures there do not respond proportionally during the trailing La Niñas. Those upward shifts are the long-term responses to the discharge phases of ENSO that occurs during strong El Niños. As part of the discharge phase of ENSO, the El Niño takes warm water from below the surface of the western tropical Pacific and places it on the surface (warm water that was created by the increased sunlight during the prior recharging La Niña). The discharged warm water floods into the East Pacific, where it temporarily raises sea surface temperatures during the El Niño, but causes little long-term trend there. And at the end of the El Niño, the warm water is redistributed by the renewed trade winds, ocean currents and the downwelling Rossby wave into the West Pacific, Indian Ocean and eventually the South Atlantic. The East Pacific represents about 33% of the surface of the global oceans, and the South Atlantic-Indian-West Pacific covers another 52%. That leaves the North Atlantic, which has another mode of natural variability called the Atlantic Multidecadal Oscillation. The Atlantic Multidecadal Oscillation, according to NOAA, can contribute to or suppress global warming. And so far, the only global surface warming we’ve seen was in the South Atlantic-Indian-West Pacific subset and that warming was caused by discharge of sunlight-created warm water released from below the surface of the West Pacific Warm Pool during El Niño events. Speaking of the North Atlantic, and back to GaryM’s basic question, an El Niño causes surface temperatures in many regions outside of the tropical Pacific to warm not as a result of the direct transfer of heat, but as a response to changes in atmospheric circulation. The processes through which those changes occur were discussed in minute detail in Trenberth et al. (2002), which was why I linked that paper for GaryM earlier. Isn’t that curious? That’s two papers by Trenberth which state that temporary blasts of sunlight associated with ENSO warm the oceans of the tropical Pacific, the Atlantic Ocean and the Indian Ocean. And what processes can’t climate models simulate properly? ENSO and teleconnections. No wonder they come up with the wrong answer. Looking at the ocean heat content data for the tropical Pacific (here), provides the answer to Trenberth and Fasullo’s question “Where did the heat for the 2009–2010 El Niño actually come from?” The supply of warm water for the 2009/10 El Niño was initially created during the 1998-01 La Niña, and it replenished the warm water released by the 1997/98 El Niño—warm water that was created during the 1995/96 La Niña. And according to two Trenberth papers, that warm water is created by temporary blasts of sunlight. One of the key questions in that quote that Trenberth and Fasullo failed to answer was, “Where did the heat suddenly disappear to during the La Niña?” It didn’t disappear. The JPL sea level animation of sea level residual maps linked earlier (here), and the graph of sea surface temperatures of the South Atlantic-Indian-West Pacific subset (here) show quite plainly that the left-over warm water from the 1986/87/88, 1997/98 and 2009/10 El Niño events was redistributed within the oceans to form the Trenberth “big jumps”. And as Trenberth and Fasullo (2011) note, while the tropical Pacific is releasing heat to the atmosphere, the Atlantic and Indian Oceans are gaining heat due (1) weaker surface winds, which results in less evaporative cooling, and (2) the resulting reduction in cloud cover which allows sunlight to penetrate the oceans to depth. The effect of ENSO on the sea surface temperatures of the tropical North Atlantic is discussed in Wang (2005), and it helps confirm the statement by Trenberth and Fasullo. I provided graphs in a recent post (here) and in my book Who Turned on the Heat? that confirm Trenberth and Fasullo’s claim that ENSO does in fact cause variations in the ocean heat content of those ocean basins. 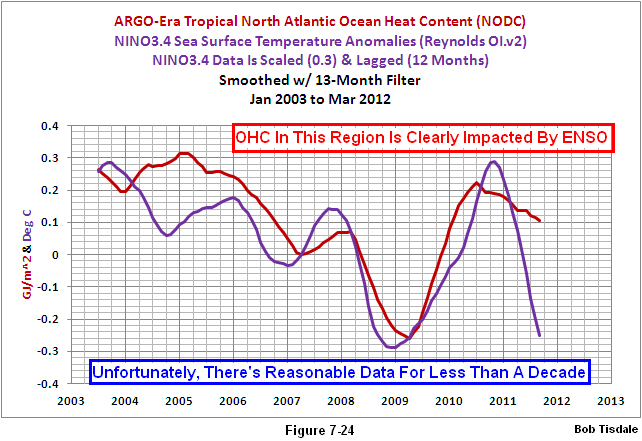 Those graphs compared an ENSO index to ARGO-era ocean heat content for the Indian Ocean and the tropical Atlantic. The Indian Ocean to depths of 700 meters (here) warms in response to the El Niños but does not cool proportionally during La Niñas. The failure to cool proportionally is likely a result of the warm water released by the El Niño being distributed into the Indian Ocean by the Rossby waves and the Indonesian Throughflow during those strong La Niñas. For the tropical North Atlantic (here), we can see that the ocean heat content there warmed in response to the 2009/10 El Niño and cooled during the La Niñas before and after it. Let’s look again at the tropical Pacific. In the animation here, we can watch ENSO distribute heat from the tropical Pacific to the adjoining ocean basins. It doesn’t take much of a brain trust to figure out what will happen during a period when El Niño events dominate ENSO. Global surface temperatures and ocean heat content (even remotely in the North Atlantic) will warm. They have to. I’ve only glanced at the some of the arguments on this thread, those that argue against what I have presented over the past 4 to 5 years. They’re repeats of arguments I have replied to over the years. Examples are here and here. And some of the comments on this thread were from persons with limited grasps of the truth. To close this comment, this is not a theory I created. In fact, I haven’t presented a theory. I present data…data which illustrates, supports and expands on known processes presented in peer-reviewed papers. Thanks again to Donald Rapp and Judith Curry for raising this important topic. And thanks to GaryM for asking a simple question that required a detailed answer. And I will again apologize for taking so long to reply to GaryM’s question, but I had other obligations. It’s unlikely that I’ll be back to this thread, so if you have questions that were not answered by this reply or questions that were not answered in any of the blog posts linked to it, please feel free to ask it at my blog Climate Observations. The closing paragraph was of course about returning to the thread at Climate Etc. And this is the post linked for those with questions. 25 Responses to Answer to the Question Posed at Climate Etc. : By What Mechanism Does an El Niño Contribute to Global Warming? Great explanation. I would not worry too much about the “barts” of CE. He seems to be ridiculed by even the warmists of that site. Not that I could have posed the question, but I did learn from your answer. “By what mechanism does an El Nino ‘contribute to global warming?’” is central to beginning to understand the climate in this water planet called “Earth”. Thanks for the links, Alec, aka daffy duck. The hotspot is in the Northeast extratropical North Pacific, but the ozone hole is in the Northwest. Something is missing! Continental drift – – force vector analysis applied to the west side of the Americas and plate tectonics applied to study an infra red line from slightly north of the Galapagos Islands to New Zealand. Since we now have satellite picture data of infra red analysis that shows an extremely hot “plate” overlap or a crack in the bottom of what might be called a cañon bottom. A crack like “deep” – exposing sea water to the heating from the Mohorovicic substrata in the ocean bottom – about 20,000′ to 30,000′ feet deep. For those not trained in Geology, Physics and Mathematics the Mohorovicic substrata is the transition from the earth crust to the molten “lava” of the earth’s core – ejected as volcanic (over 2,200° F) lava eruptions. In short the tectonic forces seem to be quite consistent but the earth crust resists the movement so it is expressed by jerks (providing the “El Niño”) exposing “fresh (reddish) hot plastic” rock like properties to heat the seawater to the +/- 400° F range and which appears on infra red photography as a nearly straight Red Line – Galapagos to New Zealand that will spread in width (north and south) to over 100 miles wide and warming the ocean surface normally, from 7° to 9° F (hot water rises – cold water sinks) and / or recognized as the El Niño effect. Warming the sea water which lowers the surface tension allowing much more evaporation and subsequently atmospheric moisture is increased to make clouds and fog, etc. This atmospheric moisture is carried to the North East by the “prevailing westerlies” and “trade winds” and provides the most powerful Green House Gas (water vapor, clouds – fog) producing +/- 97% (Scotese, Berner and Gerhard) of the warming potential (CO2 – 0.028% inconsequential in effect) and which will provide rain clouds resulting in rain in the western USA and Mexico when cooled below the dew-point. T, J. Gilbert, without data to support your subsurface-volcano theory of ENSO, all you’ve provided is speculation. Please show me the data. Hey Bob, I wish I had seen your write-up prior to my recent article on Indian Ocean warming. You have wrote that “The Indian Ocean to depths of 700 meters warms in response to the El Niños but does not cool proportionally during La Niñas”, along with a figure based on the argo heat content. In the article, I have explored the asymmetry in ENSO forcing, and the positive skewness during recent decades, to explain the century-term warming trends over the Indian Ocean. We also used sensitivity experiments with climate models to establish this mechanism. We found that, even without greenhouse gas forcing, El Niños piles up the heat over the Indian Ocean, even though the magnitudes are small. Appending the positive skewness due to increasing El Niños in the recent decades, this warming turns out to be enhanced. Though the Indian Ocean warming is due to the El Niño events, it is possible that the higher frequency and magnitude of El Niños are due to greenhouse warming. We haven’t explored that aspect though. I see that this is an old post of yours. Let me know if you have read my comment. Ref: Roxy, M., K. Ritika, P. Terray, and S. Masson, 2014: The curious case of Indian Ocean warming. J. Climate. doi:10.1175/JCLI-D-14-00471.1. Roxy, thanks for the comment and the link. Pingback: Researchers Find Northeast Pacific Surface Warming (1900-2012) Caused By Changes in Atmospheric Circulation, NOT Manmade Forcings | Watts Up With That?